This post is part two in a series of three posts on school choice focusing on value: the value in true bi-partisan support of an issue, the inherent value in choice, and the ultimate value in education. Read part 1 now and check back on 23 September for part 3. Bigger than the school choice issue, choice in general has inherent value. The Merriam-Webster’s Dictionary defines value as “relative worth, utility, or importance” and “something (as a principle or quality) intrinsically valuable or desirable”. 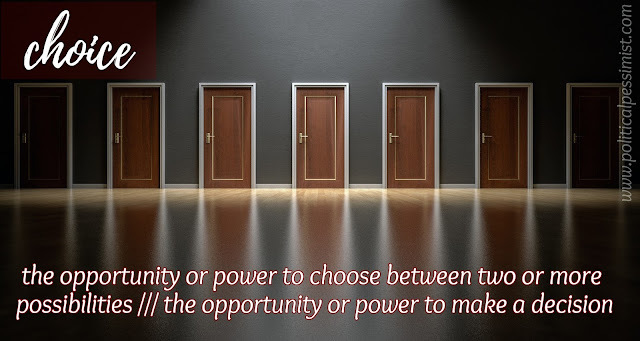 Choice is defined, in the same source, as “the opportunity or power to choose between two or more possibilities” and “the opportunity or power to make a decision”. Choice is important to prevent monopolies, defined as “exclusive possession or control” or “exclusive ownership through legal privilege, command of supply, or concerted action”. Choice, no matter what the issue at hand is, creates three things: opportunity, empowerment, and ownership. Without choice, there is no opportunity, and worse, no progress. Lack of choice is a creature of habit, a guardian of the status quo, and enemy of progress. Opportunity means the chance for something new and different, and is often stymied by fear of the unknown and having to work to make a change. As Thomas Edison said, “Opportunity is missed by most people because it is dressed in overalls and looks like work.” Having choice and opportunity means taking risks. Another key factor of choice is empowerment of the individual. That sense of pride and self-fulfillment cannot be achieved by doing something you’ve always done. Albert Einstein said that “Problems cannot be solved with the same mind set that created them.” Creating the power and possibility to shift the world around you—from a change in how you spend your time day to day to bigger, life-altering changes like where and how you are educated—and handing that power to an individual is the greatest form of empowerment you can give someone. You are holding your future, or the future of your children, in your hands. Why would you abdicate the power to create opportunity to anyone else? Finally, choice creates ownership. After being empowered by opportunity, you get to own that choice. Being able to say, “I did this. I chose this. I built that. I seized that opportunity.” is critical to success in any arena. Empowerment without ownership is hollow, as is choice without owning that choice. Basic economics teaches us that where there is competition, there is growth. If someone can operate in a monopoly, unchallenged and unchecked, what incentive is there for improvement and growth? If there literally is no other choice, what reason is there to change or get better? No one can do anything about it, so why bother? When choice is introduced and a monopoly is broken, doors, windows, roofs, holes in the wall, craters in the ground, and wormholes in the sky open up. Not only is there competition, but the incentive to change in order to keep customers, clients, or students is created. Choice allows the best to survive and thrive. And everyone wins when the best is in competition with each other. Choice is scary—especially for the status quo. When you get used to being mediocre and still used or hired, being thrust into the arena of change can create anger and resentment. In some ways, the creation of choice almost sends monopolies into the stages of grief—mourning what was once “theirs”. We have seen this happen time and again with school districts who create a hostile environment for charter schools, private schools, homeschoolers, and any other non-monopoly form of education. But school districts who want to thrive have learned to embrace that chance. As discussed in the first article in this series, Denver is a great example of creating positive change when challenged with choice. Washington, DC has been another well document example of this. Districts that continue to fail are those who tend to oppose choice, and district who succeed are those who have found a way to work with, and truly compete with, other options in their district. Coincidence? Absolutely not.